Sonneta Voice Monitor by MintLeaf Software Inc.
Sonneta Voice Monitor is used by speech-language pathologists, voice coaches, and their patients and students. 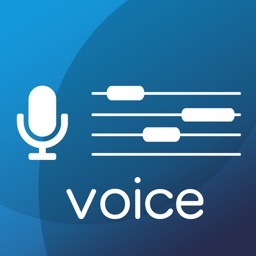 It is the only app of its kind to use a pitch detection algorithm published in a leading peer-reviewed journal in voice research. 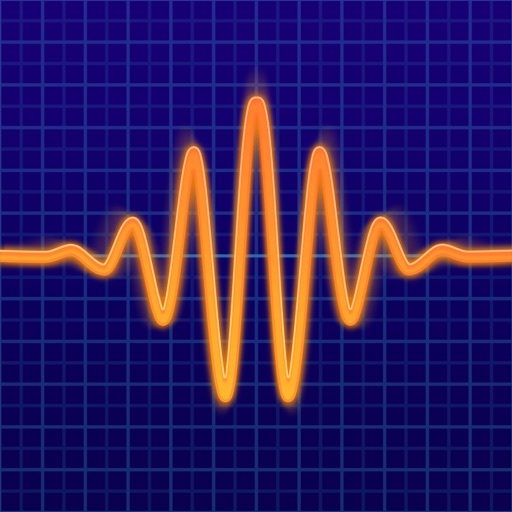 Sonneta Voice Monitor is used by clinical faculty and researchers at over 30 universities and teaching hospitals. • Measure vocal pitch (fundamental frequency) and sound pressure level (SPL). • Real-time meter display and moving chart provide you with hands-free feedback for singing or speech therapy exercises. • Designed specifically for measuring the human voice — talking, singing, shouting, and humming. 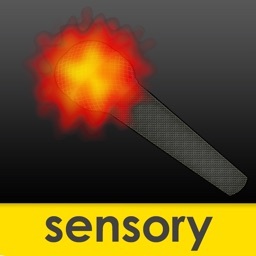 Sonneta Voice Monitor will not measure the frequency of non-vocal sounds such as whistling, musical instruments, etc. 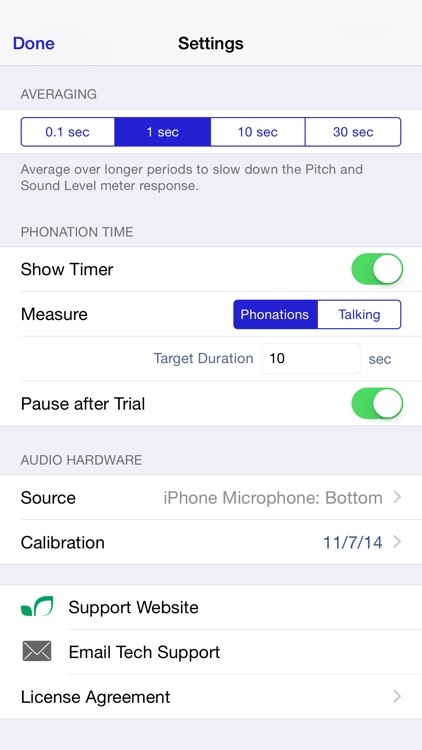 • Automatic hands-free measurement of phonation (vowel sound) duration. 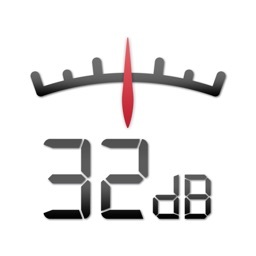 • Allows you to set target durations for visual feedback. • Useful in conjunction with LSVT under supervision of a qualified clinician. 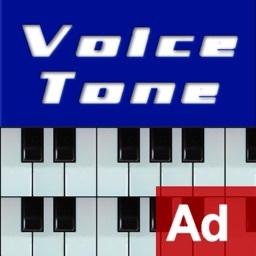 • Record samples of your voice for later playback. 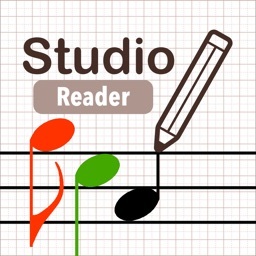 • A recordings list organizes samples by date. • Option to give a title to each recording. 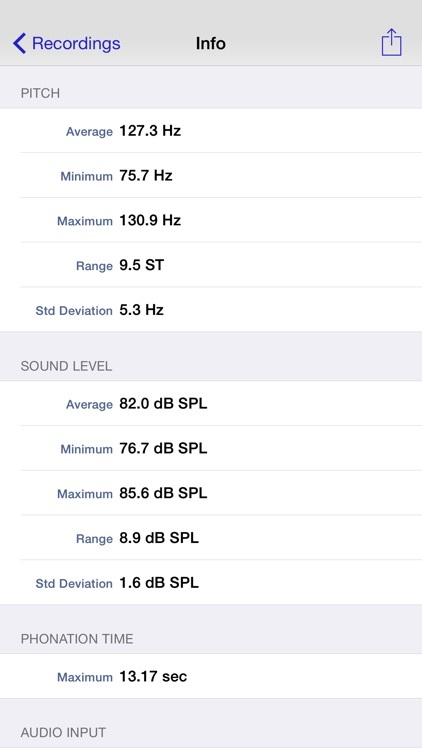 • View statistics for each recording including average, minimum, maximum, range, and standard deviation for pitch and sound level; maximum phonation time. • Select a sample from the recordings list to play back over the speaker. 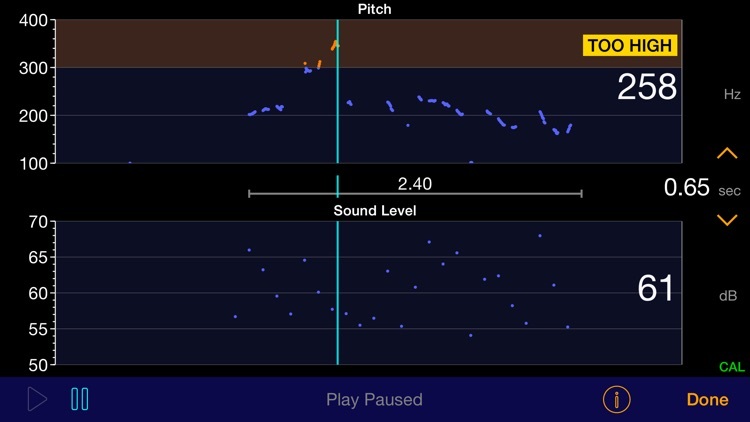 • Pitch, sound level, and phonation time are displayed during playback and scrubbing. • File your recordings and data by client, by voice exercise, or any way you like. • Export measurements and statistics to a spreadsheet. • Share your recordings with your speech therapist using Mail, Messages, or AirDrop (provided you both have the latest version of Voice Monitor installed). • Speech therapists and voice coaches can record prompts for their clients to play back during practice. • Record any number of prompts and select them by title. • Therapists can also set limits for pitch and sound level. Users are alerted if they exceed the limits. • Prompts, limits and phonation targets are saved independently for each client file you create. • Voice-activated calibration allows you to measure absolute sound level no matter where you place your iPhone or iPad. It even works with external microphones. Calibration requires a sound level meter (sold separately). 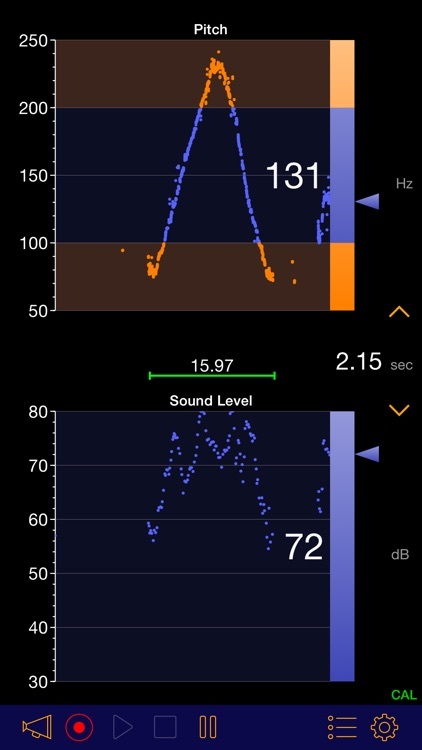 • You can use the app without calibration to measure relative sound levels. 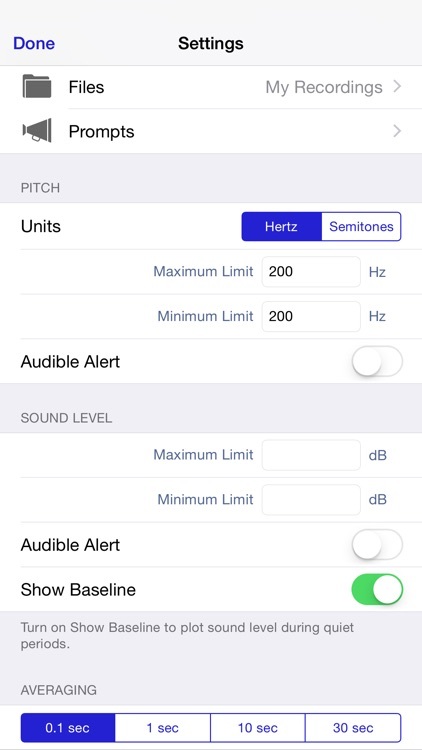 • Pitch is measured in Hertz or semitones and does not require calibration.